Readers, I have a confession to make. A possibly dark confession that some of you may be shocked by. Not one I am ashamed of, but one that you don’t hear very often from 20-somethings wanting to work in theatre, or much of the entertainment industry in general. I have never (and probably will never) consider a move to New York City or LA. Why? Simply stated, I have no desire to. Those two cities hold none of the allure for me that they do to so many others. I have no desire to “make it big” and “be famous”. Sure, I would love to make some more money. But I don’t want to have to hustle and pound the pavement All. The. Freaking. Time. I want to be lazy and switch back and forth among a few steady gigs. I want to live long enough in a place to establish a garden that comes back every year. I want to have friends who’ve known me for years, not just new people to party with at every gig. And most of all, I want easy access to nature and pretty scenery. I’m not opposed to cities. Portland, Seattle, Atlanta, Denver, Raleigh, Sacramento, and San Francisco all sound like great places to live. I’d even consider Chicago, but mostly because I want snow and the city itself seems interesting, not to mention the theatre scene. However, I also fantasize about doing theatre in a small town. Maybe someplace like Murphys, CA. Someplace small enough that telling the stories of the community could really have an impact. Right now, I am fortunate to work at a theatre that actually does a really high proportion of plays written by our company members. All of our School Tour (traveling show that goes to schools and does 40 minute assemblies) shows are written by people who live in the Sacramento area, and most of them have been here for 20+ years. The spring Tour show even consists of play ideas from local students, tweaked and developed by our company. 3 of the 4 Family Series shows done each year are also written by company members. And every year Buck, our artistic director, writes our holiday show, that may or may not have anything to do with the holidays. Our current mainstage show is written and performed by Jack Gallagher, a stand-up comedian who has made Sacramento his home since the 1990s. However, none of our other mainstage or B3 shows (the two series for adults) are ever written by local playwrights, or even are new works being fully developed. They are shows that were already produced somewhere else and have been (at least slightly) tested. I want to be able to be a part of a work that gets developed from the ground up. I want to watch the actors, director, and playwright all shape each other and a show together. I want to be in the rehearsal process, helping to create a safe place so that I can watch these amazing people create something new. Or I want to be able to work on the design challenges of a new show, and get to spend some quality time making it a great labor of love. I got a chance to work on a smaller scale on a show like this at New Helvetia Theatre this past summer. The director, writer, and actors all had a great, open relationship that allowed for dialogue about what was working in which scenes and possible ways to take the character and story. It was a fantastic experience, and I want more of it! I want to be part of the process longer and to get to see a show fully produced from the little tiny seeds of conception. All I know for sure is, I DON’T want to do any of these things in NYC or LA. I’d rather make stories by, about, and for people in all the other parts of the country, especially NorCal and PDX, since they are the places I know the best. 1. Go dancing twice during the month. It’s good exercise and makes me happy. 2. Apply to 3 summer jobs. Knowing I have income lined up will help me not have to think about surviving this summer. And will help me to be able to set a firmer date about moving out. 3. Pay down my credit card to under 2000 (I’m currently at 3k). My deal with myself is that I can’t move out until this is paid off and I have 1k in my savings account. 4. Join a dating website. Since I have no idea how else to meet new people, and my social skills are getting worse every month. 5. Go 5 days in a row without eating anything sugary. Because I want to break the addiction. 6. Use my new fitbit every day and increase my (average?) steps by 1k at the end of the month. Honestly, If I just learn how to use it well and get a good base record going so I know where to focus on activity goals for Feb, that would be enough. 7. Go to church at least twice. 8. Finish one sewing project for myself, as well as altering my Powell’s Tshirt that is too big. I think that’s plenty to keep me busy. So, after my post earlier this month about creative things I would like to do more of, I caught a cold. And that cold allowed me time to do nothing by lie in bed (after work) and read…plays. I managed to read 2 plays in 2 days, and was inspired to read many more. Then the holidays came, and I haven’t had a chance to read a play again until tonight. This is something that I have lost working in professional theatre. I don’t know if it’s because I’m scared to be cut down or to have to defend my seemingly ever-dwindling beliefs, or if others just don’t care, or because it doesn’t sell, or I feel the need to be neutral as a Stage Manager…But whatever the reason, those faith-affirming conversations rarely come up at my current place of work (we do shows mostly for entertainment and to sell tickets, as opposed to start discussions), and when conversations do come up, I pretty much stay out of them unless someone asks me a direct question. All that to say: I like this play. A lot. I would love to work on this play and see how it moved audiences. It has so many elements that I adore: faith, Female protagonist, social justice, real ending, and is based on a real person. I’m not sure how well the structure of the play will work on stage, but I find the story of Mrs. Packard’s character compelling, hard, and inspiring. I don’t think I could have held on to my faith if I was in her place. I think I would have denied my beliefs so that I could be with my children. But at the same time, I would like to try to be like her and I admire her. If you are in the PDX area in February, and any interest in religious freedom or women’s rights issues, go see this show at GFU. I don’t think I can get any time off of work, but if I can, I am going to fly up there to see this one. So, when FP decided to organize a secret santa gift exchange via her blog and Elfster, I joined. Gifts were supposed to be either made by us or under $10. I sent one of my handmade reusable grocery bags to my recipient, and I received a decorated box full of makeup sample goodies. I call it a win!! Ok, so, It’s been awhile. I thought this blog would be a great new way to record goals and progress and be able to measure how far I’ve come, etc, etc. And then I don’t update for over two months. Whoops. Well, I’ve been thinking for awhile that I needed to update. Even composed some posts in my head. But never got around to fighting with the internet at my house/making alone time to write/having coherent thoughts/just doing it. My friend Claire Willett posted about an article that she was shocked to find anyone had ever not read, and since I hadn’t, I gave it a read. It managed to encompass many of the doubts and insecurities I have about myself and my life right now. I’ve always had a hard time imagining life beyond school, and Into the Future. One would think that would mean I couldn’t be dissapointed in my life because I wasn’t failing to reach any unrealistic goals, but no. It just makes me wonder a lot if This Is It and Shouldn’t I Be Somewhere Else Having Done Something By Now? Anyways, this article made me think that maybe, just maybe, my twenties haven’t been a waste. And that maybe, instead of talking about the creative stuff I want to do, I need to do more of it. Sew. Blog. Draw. Paint. Walk. Bike. Hike. Sew. Read. Read plays. Write plays. Stage plays. Work with a young, imaginative theatre company. Be a barista. Learn to make friends with strangers. But mostly sew. The best way to learn more sewing techniques is to do them. And the best way to learn how to read plays and visualize them is to Read Plays. Lots of them. And work with the people all around me. Also, for the first time (ever, I’m pretty sure), It occurred to me that after some more significant years of experience, I actually might not mind doing my direct boss’s job. Good thoughts to tumble around. Last week I dropped my gym membership. I just hadn’t gone since February, and since I came back from Europe “having enough time” was not a valid excuse. I’ve been looking for some ways to cut my spending so that I can pay off my loans and save up for Hawaii, and 24 hour fitness didn’t make the cut. This means that I need to find some ways to exercise at home, using what I do have. Because I also want to work, nay FOCUS, on my “get healthy” goal of loosing 15 pounds by Christmas and exercising 4 times a week regularly. I re-discovered the stationary bike that is in my Mom’s bedroom (and has been there for about 5 years – WHY haven’t I been using it all along?). I figure if I can do 2 times a week on that for 30-40 min, I would have a good start. But that will not be enough, and I want to do more than just cardio. I want to build some muscle, and right now I am mostly fat and internal organs. I decided to try some body weight exercises. I figure once I can safely do 3 circuits of these, I can look for some more to add to the list, such as the hated burpees. I managed to get most of the way through 2 circuits tonight, leaving out the dumbell row because I didn’t want to go downstairs to get two chairs. Which sounds lame now that I have typed it out. It’s a little hard to tell if I am doing them correctly, since I can’t see myself do them. My left ankle started hurting in the middle of my second set of lunges, so I decided to cut it short. Anyone want to do this circuit with me in person sometime? I’m hoping to ride my “sewing mojo/spare time/no money to go out” wave and I joined a coat sew-along on Gerties New Blog For Better Sewing. I have yet to ever finish a coat (and I think only have 2 half-finished ones in my UFOs). I’m hoping by doing this sew-along I can learn some good tips and get the encouragement to see the project to completion. It’s been ages since I’ve sewn the same project with other people, and I remember it used to be helpful. 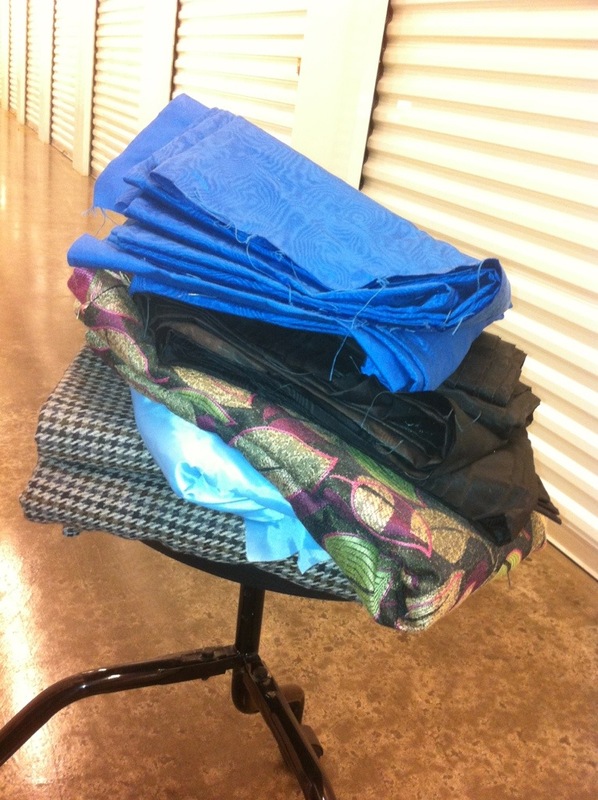 I picked out two different outer fabric options from my stash, as well as 3 lining options. One of the fabrics has me way more excited than the other, but I’m not sure I have quite enough yardage of it. I may just have to shorten the length of the coat or add a boarder on the bottom so that I can use my fun fabric, however. I did have to shell out money for the pattern today. Fortunately, it was on sale for $1.06 (99cents plus tax), and I did a 30 min workout yesterday, so I earned my $1 for the pattern then. My two main goals for this project are 1. to finish on schedule and 2. to not spend any more money on it. I looked over the instructions pretty thoroughly, and I think I have all of the supplies, except maybe some awesome buttons. If I really get to the point of finishing the coat, I may have to splurge on some awesome buttons. Preferably largely oversized!